Summer in Durango, Colorado, is really kind of perfect. Forget the Mile High City’s measly 5,280 feet (no offense, Denver). Durango sits at an elevation of 6,500 feet surrounded by the San Juan Mountains, which usually* keeps the city’s summertime temperatures in the 80s. 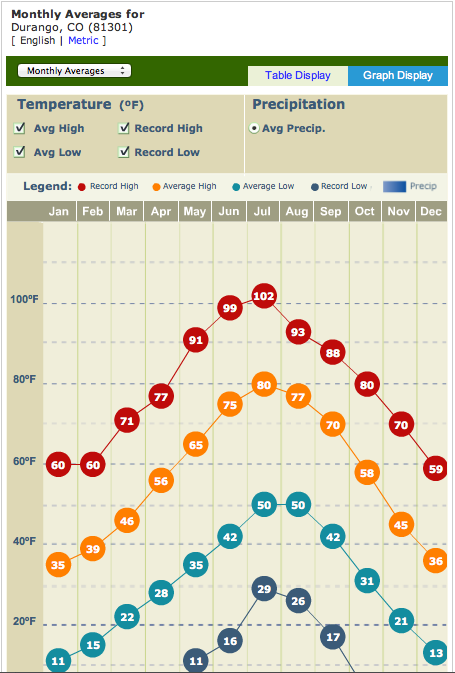 Durango’s average high temperature is 75 degrees in June, 80 degrees in July and 77 degrees in August, which is pretty darn close to perfect weather for all that hiking, biking, fishing and rafting you may be doing. Who needs 72 degrees anyway? That’s, like, almost chilly. *We cannot guarantee that the temperature won’t soar to 102 degrees, Durango’s all-time record high, which was set in 1973. Make your summer stay even more perfect by booking your room at the Quality Inn Durango today.